This week's Top 10 List is about popular authors we've never read. Since I typically read contemporary YA, I thought I'd make a list of books by YA authors who write about other genres, that I have yet to conquer. Please let me know in the comments if I need to make one (or all) of these a priority on my TBR list. Be sure to check out The Broke and the Bookish for more details on this awesome weekly feature. I haven't read any of these books either :P I read mostly contemp lately, so I have the same problem. I do have some of these books on my shelves, so I might pick them up soonish. Great post Ginger! From your list I've only read Legend and The 5th Wave - all of the other books are on my TBR list though! You KNOW how I feel about non-contemp YA. If I were to pick among these as the first one for you to read, I think I'd pick CINDER because it has a solid crossover appeal. And a super swoony romance too of course. I've only read Graceling and can't really rate it too much. I know I liked it enough to read the next book but it hasn't stayed with me. 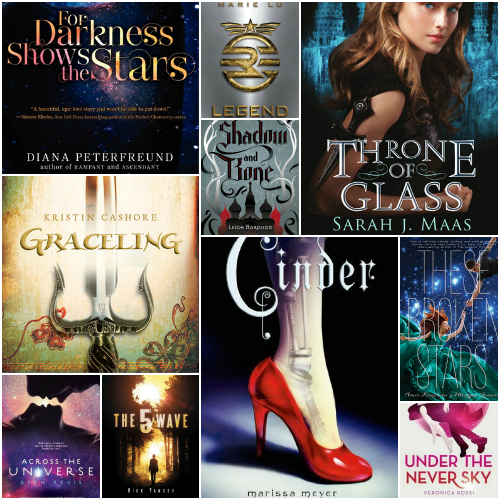 Cinder and These Broken Stars are the two I really want to read from your list. Thanks for sharing! Oooh Marissa Meyer!! So worth a read! I still need to read Scarlet and Cress though! I can't believe I forgot to put sarah j Maas on my list!! I need to read her! Well, I totally think you should read Marissa Meyer. I'm not a science fiction fan at all, but those books are AMAZING! She knows how to put together a great series. I haven't read For Darkness Shows the Stars, but I did read Across a Star-Swept Sea, AND I LOVED IT! I definitely recommend that one. I just. I can't. So many of my favorite authors are on the list!!!!!!!!!!!!!!!! Good list, I haven't read any of these authors either other than Marissa Meyer who I loved. I actually didn't really like Across the Universe *ducks and hides* I need to find some time to finish Cinder. What I've read I like so far. Shadow and Bone=Amazing. My gosh, Graceling is one of my favorites! Cashore writes some great feminist characters. Lol, there's only 2 on this list that I HAVEN'T read haha. Of them all, For Darkness Shows the Stars and These Broken Stars are probably the most contemporary-esque, but Cinder, Graceling and Under the Never Sky are just the start to three AMAZING series. You really couldn't go wrong with any of them! I too tend to gravitate towards contemporary (and historical fiction) -- dystopian and fantasy are usually the genres I rarely pick up. Many of these I would like to try because bloggers always gush over them. I have read Cinder (it was OK), and Graceling (really enjoyed!) but have yet to get to their sequels.